Our Personalized Boss Magazine Cover makes a great personalized announcement for a bosses day celebration. Honor him or her on their special day with a treasured keepsake that lasts a lifetime. Our Custom Printed Business World Magazine Cover is printed on a high gloss paper and put into our 8" x 10" Black Frame. Picture frame includes an easel back that allows for desk display or can be hung on the wall. Includes FREE Personalization! Upload your favorite digital photo below. Personalize with Bosses Name and date. *Due to the style and design of this item we reserve the right to adjust and crop photo as we see fit. This is very nice site to have a transaction because they are going to guide you all through the transaction and make sure everything is 100% okay with your transaction. They do great job to satisfy their customer. It is better then I expect. Top quality!! I will be ordering more. 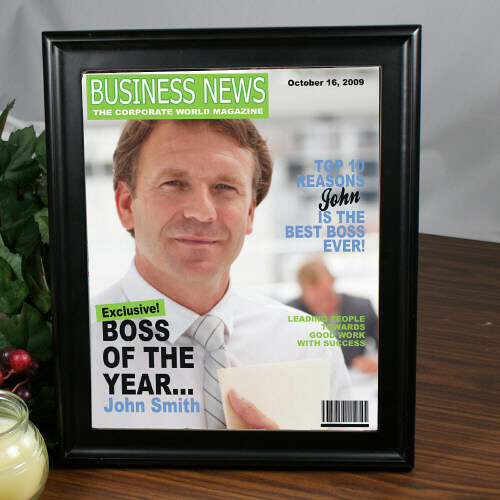 Additional Details Bosses Day is the perfect time to present your favorite Boss with his or her own Personalized Executive Gift from GiftsForYouNow.com. We specialize in unique and classical gifts your executive will enjoy using or admiring every business day. Shop GiftsForYouNow.com for all your Personalized Boss gifts.